The "Holey-est State" in the U.S.
Human beings have been exploring caves since the dawn of time. In human prehistory, they provided shelter, as well as a canvas on which prehistoric man could paint his desires for a good hunt. These early hunters apparently believed depicting the outcome they desired would cause it to happen. 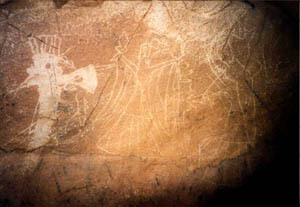 A wonderful display of paleolithic cave paintings was discovered on Christmas Day, 1995, at Vallon-Pont d'Arc in Ardeche, France. Here in Tennessee you are more likely to find petroglyphs or mud glyphs than cave paintings. Usually these were made by the Archaic, Woodland or Mississipian peoples. Among Stone Age cultures, caves had great ritual significance. The Maya of Central America believed that caves were the gateway to the Underworld and, therefore, any rituals performed there would quickly gain the notice of ancestral spirits. So strong was this belief that some temples were carved to resemble caves, or in some cases, -->built over caves to encourage the spirits to interact with living priests. The Native Americans of the Northern Hemisphere also believed that caves were sacred places. Archaic and Woodland Indians sent their bravest warriors into the dark recesses of Mammoth Cave to mine epsomite and gypsum crystals. Those who returned were honored and the crystals they brought home with them became sacred heirlooms or sought-after trade items of the tribe. In more modern times, caves have been used for a variety of purposes: refrigerated food storage during pioneer times, saltpeter mining and weapons storage during the 1800s, speak-easies and hideouts for moonshine stills during Prohibition, and dance halls during World War II. Cumberland Caverns in Tennessee still contains a large dining hall which is regularly used for parties, receptions and Scout camp-outs. Currently, extreme outdoor sports have gained popularity thanks to the "Mountain Dew" mentality of "been there, done that." For this reason, many of those who explore caves on a regular basis (cavers) feel they must double their efforts to educate the public to the fragile nature of the cave environment. Because they are mysterious and can be dangerous to the unwary or the unprepared explorer, caves may seem dark, menacing or even evil to some people. This image has been perpetuated by cases where caves have indeed been used as hermitages, hideouts for criminals or fugitives, or as regular meeting places for covens or cults. There are a substantial number of caves in TAG which show evidence of such usage and a few which are documented in public or historical records. However, the vast majority of caves are home only to bats and crickets. Nevertheless, wild stories and local legends persist. Probably the most famous of these is the story of the Bell Witch, in particular the supposed manifestation of an evil presence in Bell Witch Cave. "Sorry if this has been a little rambling, but these oral tales are sometimes hard to commit to writing. There is an interesting note, there is a cave on the old Bell farm (which I have personally visited) which supposedly is the seat of all the supernatural activity. When some of the Bell children played in this cave, something weird would always happen to them. It is easy to dismiss this as a sort of post script attatched to the story by a later generation, until I read that the native Americans of the area regarded the cave as spiritual, long before the Bell family came to Tennessee. When all these factors are taken into consideration, it is difficult indeed to say just what sort of manifestation for sure the Bell Witch was. If you'd like to read more about this, two good books are: The Bell Witch of Robertson County, Tennessee, by Charles Bailey Bell (John Bell's great grandson I believe) and The Bell Witch by Charles Edwin Price ." Many TAG cavers have heard rumors that a long-time caver was cremated and buried in a cave somewhere in TAG. Here is the true story behind that rumor. A name familiar to many original TAG cavers is Art Bosnak. Art was a giant of a man (well over 7 feet tall), certainly the largest caver in TAG, with a passion for cave research and photography. When he walked through a house, the walls shook. When he sat down, furniture creaked and strained. Yet he drove around in a teeny tiny MGB convertible with the front seat removed, and his greatest joy in life was exploring caves. In particular, he took great joy in seeing the many varieties of formations and in exploring pristine passages. In the late 70s and early 80s, Art was one of the prime instigators of the Spectre Grotto, which eventually moved from Sparta to Cookeville, Tennessee. 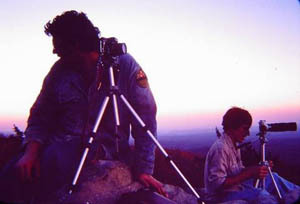 His dedication and enthusiasm for exploration, photography, surveying and biological research made him widely known and liked throughout TAG. To this day, many widely recognized cave photos and many cave maps or cave features bear his name, including the largest walking borehole in Tennessee, Bosnak Borehole in Blue Springs Cave, which was named to honor him posthumously. After some routine dental work, Art became quite ill. Two of Art's friends, Ross Cardwell and Marvin Bullock, took him to the emergency room of the hospital, where it was discovered that a bacterial infection had attacked Art's heart valves. Following a three-month stay in the hospital in Nashville, Art went to visit his parents at their home in Ohio. Three days later, on April 16, 1985, Art died of heart failure at the age of 38. TAG cavers mourned his passing in true TAG fashion, with parties, caving trips and bonfires. Art had requested that his body be cremated. Following his instructions, his friends placed his ashes in a sealed length of PVC pipe and buried it at the bottom of Ellison's Cave, where Art could enjoy the beautiful formations he had loved so dearly for all eternity. According to some sources, Art's closest friends have periodicaly removed Art's ashes from their resting place and reinstated them in another cave for a time. Although this may seem like a macabre tradition, it is their way of reminding themselves of their friend. So, if you hear someone say they are going to take Art caving, you now know who and what they are talking about. There exists in the earth, in a cavern deep, the spirit of a very large man. Buried there in the sand, among the formations tall, and near the bottom of a Mountainous Hall. no one to show the wonders of his world of darkness. Darkness so black, no match to light, no candle to burn bright. He is all alone, except for an occasional bat or a caver in a hard hat. Hard-core to find his home, hidden by those who know and visit seldom, the shadow of his dome. Large in life, gentle in mind and thought, formations were what he sought. Now in a place he once could only dream of, to stay for all eternity. aware or not aware of what goes on in this life. could find his final place of rest at the bottom of the falls. and he lives once again as a formation never known to this world. and in seeing this can know that God surely does exist. A stalagmite, a type of speleothem which grows upward from a surface (Here's a simple mnemonic devise: the "g" in stalagmite stands for "ground;" the "c" in stalactite stands for "ceiling. "), is formed when water containing dissolved minerals (frequently calcite, but there are other types) is deposited on the same spot over thousands or millions of years. This process works about the same for many types of cave formations. The mineral solution gradually forms a mineral deposit over time and grows upward, or downward in the case of stalactites. The development of some speleothems is interrupted by variations in the type of mineral dissolved in the water or other factors and is "detoured;" these formations may eventually become fantastically shaped formations called helictites. In this era of cybercaving, you can explore the beauty and wonders of Lechuguilla Cave in New Mexico without even getting your boots muddy. This photo map, provided by Garry Petrie, author of WinKarst software, has clickable links (denoted by the white circles) to some beautiful photos of the cave. Touching an "active" formation causes growth to cease in that area because dirt or oil from your skin prevents water from reaching the growing formation. Enough touches, and the formation will "die." For more information on cave formations, explore the Virtual Cave! The Holey-est State in the U.S.
Based on data turned in to the Tennessee Cave Survey (TCS), Tennessee currently has more discovered caves than any other state at over 8,400. Officers of the TCS guess that the state may harbor as many as 15,000 caves. However, because of differences in how state cave surveys define caves (see below), this record is a hard one to pin down accurately. Most states define caves as natural features that can be entered by human beings and which are totally dark at some point along their lengths. However, many state cave surveys also have additional qualifications, usually pertaining to length or size, for what constitutes a cave. To qualify as a cave in Tennessee, a cave-like feature must also fulfill the following requirements. It must either be longer than 50 feet (total horizontal distance or THD), have a total vertical distance of over 40 feet (TVD), or contain a pit deeper than 30 feet. Missouri contains a little over 5500 known caves (as of the May 1996 MSS meeting), but in Missouri any cave- like feature longer than 30 feet can be considered a cave. In Alabama, a cave-like feature is only a cave if it has 50 feet TSL (total survey length). For example, 20 feet of horizontal passage followed by a 30-foot pit would qualify, as would a 50-foot horizontal cave or a 50-foot pit. Any cave which contains "obligatory cavernicolous fauna" (troglobitic species) qualifies automatically under the Alabama Cave Survey's definition. One reason cave qualifications are not consistant from state to state is because different types of karst features are prevalent in different areas. Each cave survey has developed the set of qualifications most meaningful in light of its state's geology and terrain. * Number Reported denotes caves, except where marked with an "(F)." "(F)" signifies that features, rather than caves, are reported. Other punctuation marks adjacent to the totals in this column indicate there is a note pertaining to this state below the table. ^ Alabama's definition allows any combination of THD, TVD or pit depth to reach the required total survey length of 50 feet. The presence of troglobitic species qualifies a feature automatically. ** Colorado has no established definition for what constitutes a cave. & Illinois' definition describes a cave as being at least 20 feet long. ~ Indiana's definition allows any combination of THD, TVD or pit depth to equal the required 25' length. @ Missouri's definition counts any feature as a cave if it is longer than 30', using any combination of THD, TVD or pit depth. $ Texas' definition allows any combination of THD, TVD, or pit depth to meet the required length of 5 meters; however, it specifically excludes any feature with an entrance which exceeds the length or depth in any dimension. This rule was designed to exclude rock shelters and sinkholes. The Top Ten Deepest and Longest Caves in the U.S.
Kazumura - Olaa Cave System (Lava Tube), Hawaii, 3614 ft.
Umi'i Manu System (Lava Tube), Hawaii, 1869 ft.
Huehue Cave (Lava Tube), Hawaii, 1623 ft.
Lechuguilla Cave, New Mexico, 1594 ft.
Columbine Crawl, Wyoming, 1551 ft.
Emesine Cave (1881 System) (Lava Tube) Hawaii, 1433 ft.
Great EX(pectations) Cave, Wyoming, 1408 ft.
Omega System, Virginia, 1260 ft.
Bigfoot Cave, California, 1205 ft.
Neffs Canyon Cave, Utah, 1165 ft.
Kazumura-Olaa Cave System (Lava Tube), Hawaii, 40.700 mi. Organ (Greenbrier) Cave System, West Virginia, 39.500 mi. Martin Ridge System, Kentucky, 32.239 mi. Thanks to Bob Gulden, here is the complete list of the deepest and the longest caves in the World. Last Update: January 21, 2003. (C) Copyright 2003, April Hannah for the Upper Cumberland Grotto of the NSS. All Rights Reserved. Photos available on this web site are the property of individual members of the Upper Cumberland Grotto except where noted. Failure to request permission before saving these images to disk for your own use is a violation of the U.S. Copyright Law.